Firefighters battled a raging fire at several south suburban retail stores Thursday evening. The fire began around 4:30 p.m. at the intersection of 154th St and Broadway Ave. in south suburban Harvey. Eight agencies, including the Harvey Fire Department and the Chicago Fire Department, responded to the 3-alarm fire. Upon arrival, crews from the Harvey Fire Department noticed that the fire had started in the basement of the building. The flames were so massive, according to Harvey Fire Department spokesperson Sean Howard, that crews could not get inside the building. 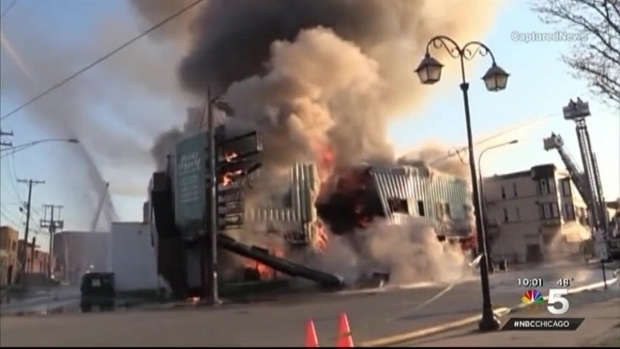 Firefighters battled a raging fire at several south suburban retail stores Thursday evening. NBC 5's Katie Kim reports. Firefighters tried to extinguish the fire from the exterior, but when the Chicago Fire Department's foam unit arrived at the scene, the building collapsed within matter of minutes. The Chicago Fire Department confirmed the collapse of the building, which housed four retail stores including a jewelry store and sporting goods shop City Sports, shortly before 7 p.m.
Flames continued to burn several hours after, with crews still on the scene into the evening. By 8:05 p.m., officials said the fire was at approximately 60 percent containment. The CFD called the devastation a "total loss." No injuries were reported, and traffic was shut down on Broadway Ave to Park Ave from 153rd to 157th Streets.